On 13th December 1903, John William Aby married Catherine Thornhill in the Long Eaton Congregational Church. By 1911, he was a jobbing gardener living in Pleasant Row, Beeston3 with his wife and three children. Twins were born to the couple in 19134. In 1914, he signed up with the Sherwood Foresters as part of Kitchener’s 'K2' Army when the 10th Battalion was formed in Derby on 13th September 1914, arriving in France in July 1915. Two of his brothers also joined up; Private George H Aby served in the Sherwood Foresters (Notts & Derbyshire) and the Lincolnshire Regiment, while Driver Harry Aby served with the Royal Field Artillery. 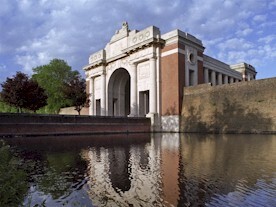 13th February 1916 - The Bluff, Ypres-Comines Canal - Having been in the Ypres Salient almost since their landing seven months prior, the 10th Sherwood Foresters relieved the 7th Lincolnshire Regiment in four frontline trenches in a position three miles south of Ypres (Ieper), Belgium, known as The Bluff. 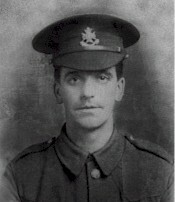 John served in "B" Company, which was given trench F29, Crater and Supports. The first night passed quietly, until the next morning (14th) an intermittent enemy bombardment of the trenches began, continuing until 3.30pm when their position came under a "terrific bombardment". Then at 5.40 pm the first of several mines was exploded under the Sherwood Foresters, "battering (the trenches) to the ground". Shortly afterwards, German infantry attacked and despite efforts of retaliation by the British over the next two days, the prized position of The Bluff had been lost, only regained a month later through some hefty investment of men and strategy. The toll of the enemy attack of the operations of the 14th - 17th February exacted 1294 British casualties. These lives were lost defending the muddy trenches that ran through and around what was effectively no more than a spoil-heap situated on the north bank of the Ypres-Comines Canal. Its forty-foot elevation served as a unique observation point in an otherwise flat landscape. John William Aby was listed as officially missing on the 14th February 1916. His youngest daughter, Joan5, was born three months later in May. In the absence of a grave, his name is listed on Panel 39 & 41 at Ypres (Menin Gate) Memorial in Belgium He was posthumously awarded the 1914-15 Star, British War and Victory medals. 4Children with the family in 1911 were Catherine Mary (b, 1906), Cornelius John (b. 1907) and Florence May (b. 1910). The twins Margery and Edward were born in 1913. Two other children are believed to have died as infants.